When pipe flanges become significantly out of alignment, it’s no small task to align them once again. Struggling with a hammer or spud wrench often results in frustration or even injury. You often need a safer, more effective way to make major adjustments to flange alignment. When your pipe flanges are more than one bolt hole out of alignment, SMP’s Equalizer Flange Alignment Tools are designed for you. With hydraulic and mechanical options and 3 different sizes, SMP has you covered. This is the lightest, most compact of the Equalizer line. Powered by a built in crank and weighing less than 5 lbs, it’s capable of creating a staggering 2,000 lbs of force. The FA1TM is ideal for smaller diameters and smaller pressure flanges. Instead of a built in crank, the FA4TM is driven by a removable 50 ft/lb. socket wrench. It weighs in at 19 pounds but creates 4 Tons of aligning force. This is the largest flange alignment tool from SMP Tools. The FA9TE is hydraulically driven and capable of creating up to 9 Tons of force. It’s ideal for re-aligning large and heavy pressure flanges. The operation of all 3 tools in the Equalizer line is comparable. Simply position the body of the tool on the lower of the two companion flanges. Place the reaction arm across the higher of the two flanges so that the tool will lift at the greatest misalignment. Fasten the safety strap to the pipe then begin operation of the alignment tool. As you operate the tool, the flanges will align so your bolts will be able to go through. Easy. Simple. Safe. 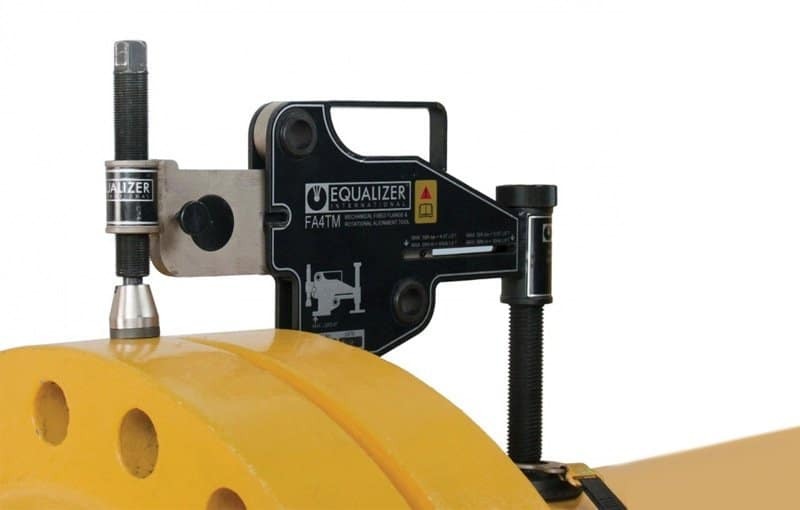 The Equalizer line of flange alignment tools not only makes alignment much easier for flanges that are significantly out of alignment, but it’s also much safer than other options. Keep your workers safe and enable them to be more effective and more efficient. Add the Equalizer line of tools to your toolkit today. Contact Us to learn more about safer, more effective industrial tools.